Picture it, the year is 1996, on the 7th day of June, or 2000, on the 23rd day of December, or 2004, on the 26th day of July. The scene is the same. One of my daughters had just been born in the same little hospital in Chambersburg Pennsylvania. Things have quieted down finally. Doctors and nurses are busy with other babies. Family members have dispersed. Mommy is asleep recuperating from childbirth. And I finally have my first moment alone with my new baby daughter. I scoop her up into my arms, I can barely tell there’s anyone in this mass of blankets! She so light. The weight of the world has yet to settle on her. I gaze into her eyes, eyes that are just waiting to be filled, and the weight of the moment consumes me. What do I say? What words could possibly capture this moment? What words do I want her to hear first from me? Hello, I’m your dad, just doesn’t sound right! Though I know she can’t understand me in this moment, for some reason these first words were important for me and needed to be chosen wisely. And so, I looked back into her eyes, and opened my mouth, and sang. Jesus loves you, this I know. For the Bible tells me so. Little ones to him belong, they are weak, but he is strong. Yes, Jesus loves you. Yes, Jesus loves you. Yes, Jesus loves you. The Bible tells me so. Those were the first words, the first song, that each of my little girls heard on the day of their birth. Before the struggles and challenges of life hit them. Before pain and sorrow. Before hunger and want. Before the scrapes and scraps that they’re going to get into. Before life had its way with them. I needed them to have a proper starting point, a sturdy foundation. Our story from Mark on the baptism of Jesus may not seem very relatable at first glance. It’s a short little story but with some very vivid imagery that has inspired many artists over the centuries. Because Jesus’ baptism included a few things that yours probably did not. I doubt the heaven’s split open when you were baptized. Or that a dove descended upon you, no matter what Grandma says! And if a voice from heaven was heard, well, we have doctors that can help with that. To be fair, Jesus’ life ultimately went down a path that none of us will have to endure. I doubt any of us will have to die on a cross to show how much God loves the world. And that’s why I love this story of Jesus’ baptism so much. Because God knew, as we do on this side of the cross, that Jesus' life was about to take a turn, a turn for the worse, a turn marked by his baptism. God claims Jesus as God’s own, says I love you, and then for added measure says, you make me happy. What child, no matter the age, doesn’t want to hear that from their parent? And as wise parents know, their children’s lives will be full of ups and downs, joys and sorrows. And so, the foundation they lay for them is of utmost importance. And so it is with us all. This is why we talk about baptism so much, especially in the Lutheran church. It is foundational to our faith walks. The words proclaimed at our baptisms are words for us to lean on in the darkest corners of our lives. Words like: love, grace, promise, life, and being called a child of God, by name. This is why we begin every Sunday worship service back there at that baptismal font, as a visual reminder that this is where your heart should return when you need it the most, on those promises, on those words. “Child of God, you have been sealed by the Holy Spirit, and marked with the cross of Christ forever.” And when we say forever, we mean forever! Because we know we’re going to make mistakes. We know we’re going to do things that God would rather us not do. We know we’re going to say things that God would rather us not say. And we are going to feel like utter failures at times, and be our hardest critic. And because of this we are going to lack courage, and strength. We are going to be fearful and skeptical. We are going to be pessimistic and on the edge of despair. And that’s when God says, "Shhhhhhhh, let us return to my first words to you." When words of promise and hope were proclaimed for you. When God’s love was proclaimed for you—a love that cannot falter, a love that will never diminish, no matter what. And that love, proclaimed at your baptism, has been there even before you knew what those words meant. 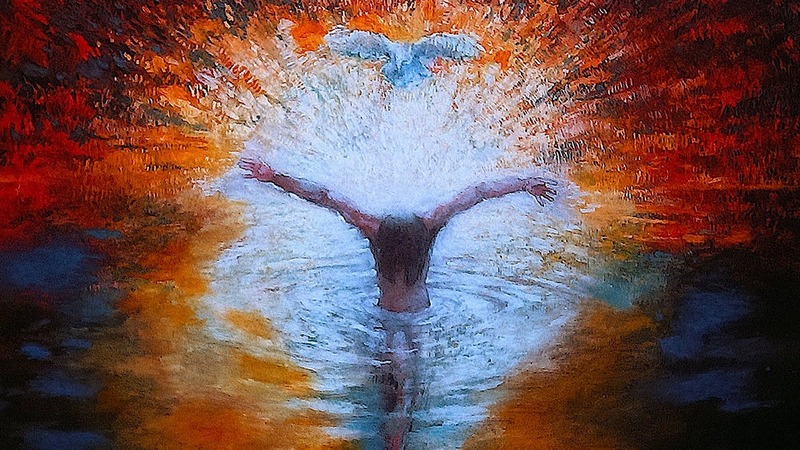 For baptism is not when God begins to love you. God has loved you since before time began. Rather, baptism is when that love is publicly proclaimed. And again, why it’s so important for us to return to again and again throughout our lives—Sunday in and Sunday out. Because let’s be honest, if we were doing ok all on our own, why would all be here today? But because we, nor our world is perfect, it is here that we return, those waters that remind us, of that age old promise spoken at our baptism. My prayer for you is that you may hear these words, as if they’ve been spoken to you by that voice from heaven: You are my child, whom I dearly love; in you I find happiness.” Return to these words as often as you need. Proclaim them to each other. Proclaim them to the world. Amen.